Michigan Education Trust has been a MAB partner for many years. As a valued partner, MAB is asking your help in promoting this very important cause. Many students in Michigan that are foster children find themselves reaching the age of 18 and having to navigate entry and attendance to college on their own. They have very limited or no resources at all. MET has put some statistics together to show the growing need for support for these students. Your help is desperately needed. “A very small percentage of foster care students gain access to higher education instituations,” stated Robin Lott, MET Executive Director. “This is a great opportunity to help those foster care students who are motivated to pursue a higher education despite their challenging situation.” There are approximately 4,000 students in the Michigan foster care system, but fewer than ten percent who graduate from high school enroll in college, and of those, less than one percent graduate from college. There are currently four Michigan public colleges that have implemented programs to help students who have aged out of the foster care system. Ferris State University, Michigan State University, University of Michigan – Ann Arbor, and Western Michigan University, all work to help foster care students secure funding for tuition, fees, room, board, and books in addition to offering them counseling and a support system. 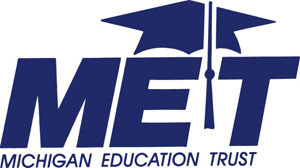 The MET Charitable Tuition Program is a way for an organization or individual to purchase from one to four years of college for a deserving individual in Michigan at a discounted price. With this charitable program, contracts cost less than a traditional MET contract, but still enjoy the benefits of locking in tomorrow’s tuition at today’s rates. To purchase a Charitable Tuition Contract, purchasers are asked to read the 2012 MET Charitable Tuition Contract, review the contract price charts, and complete and submit the MET Charitable Tuition Program Contract signature page. Charitable Tuition Program Contracts postmarked by December 31 are eligible for a tax deduction on state income tax form in the year they are made.